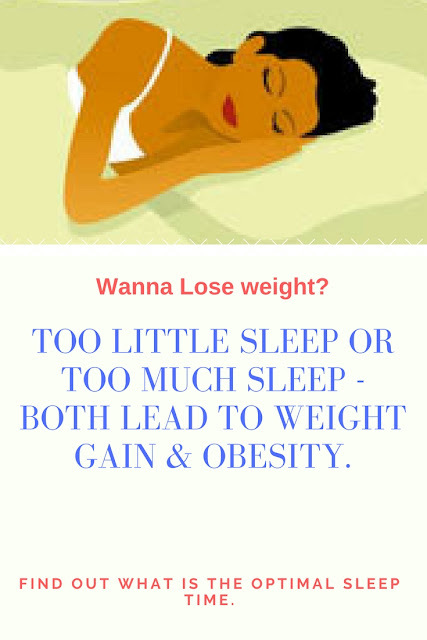 If you have a tendency to put on weight, better keep a watch on your sleeping hours. A Canadian study has found that too much or too little sleep could lead to unhealthy weight gain. Over the same time period, long sleepers (who sleep for 9-11 hours) were 25% more likely to gain 11pounds than average-duration sleepers. The results of this study clearly indicate that besides sedentary lifestyle, genetic predisposition, and excessive bingeing, improper sleep duration also contributes to weight gain and obesity. There is something called "optimal sleeping time" that will keep your healthy. As per the American Academy of Sleep Medicine adults should sleep between seven and eight hours a night . 7-8 hours is possibly the most optimal sleep duration which guarantees good health. Thanks for your contribution to Take Charge of Your Health Care Carnival. This is a good reminder of the importance of a good night's sleep for overall health and fitness. people who sleep poorly are at greater risk for a number of diseases and health problems. Lack of Sleep Ages Your Skin. When you don’t get enough sleep, your body releases more of the stress hormone cortisol. In excess amounts, cortisol can break down skin collagen, the protein that keeps skin smooth and elastic.